Despite the lack of posting in the last month, I have been knitting. I have finished three hats and one sock. I have started another hat and another pair of socks. I am spreading out the updates, so that I will at least have something to post each day. In addition to having been on a hat knitting binge, I have also been doing a lot of stranded color-work. My thoughts on this hat - I still need to block it - but the band curls up a bit. Blocking may help, but I am not holding my breath. The yarn I bought at a yarn shop in Parkville MO called Florilegium. They had a whole wall of Paternayan yarn in about 200 colors. I was mesmerized by all of the colors, and had a hard time picking two. 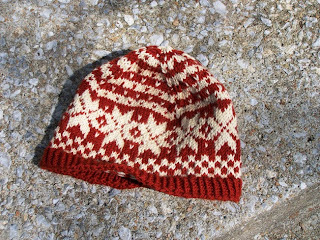 At the time, I knew I wanted to do a colorwork hat with two colors, even though I did not have a pattern picked out. In retrospect, I think the yarn is a bit too itchy for a hat. And the hat is a bit tight on my head, it has a tendency to creep upwards and off of my head.